Last week I started something new. It's a mystery Halloween bookmark from the Victoria Sampler Chat Group on Facebook. Thea Dueck (owner of The Victoria Sampler) is going to release the pattern over four weeks and we can stitch along as each section gets released. There are no recommended linens or threads, so everyone's bookmarks will be quite different. I chose some mauve linen that I had left over from my Sardinian knotwork piece (pattern by Yvette Stanton). I'm using some of the threads left over from my Haunted House - also by The Victoria Sampler. Which of course reminds me that I still have finished my Gingerbread Needlework Shop yet. I only have two more side to make now, so I still intend to have it ready for Christmas 2018. If you'd like to know more about my Gingerbread Village you can click on the tab at the top of this page - Gingerbread Village. And of course my Christmas Village is still in the "To Do" box too! An online friend in Canada had a destash sale this week, and I was tempted to buy a Chatelaine pattern and threads, but I resisted the temptation. I'm quite proud of myself. I was realistic and thought "when would I ever get to do this?". I hope you've got something fun to work on over the weekend. Wendy, that bookmark is going to be so cute! I love the mauve linen you chose! You do such beautiful work and I know it must take a lot of time! We all need more hours in a day, right?! Beat of luck with all your projects!! Ha! And here I thought you were Super Woman! I had a win this week. I finished a cross-stitch I started 3 and 3/4 years ago. The celebration was muted as it's a season sampler and I've still got the other three to go! Sigh. Hi, Wendy, I love your work. I'm starting my own blog up again (about sewing and creative stuff) and I'm trying to learn what is appropriate to show without infringing on designers' copyrights. I'm looking to you to guide me and it seems that it's okay to show other people's designs as long as I reference the original designer? 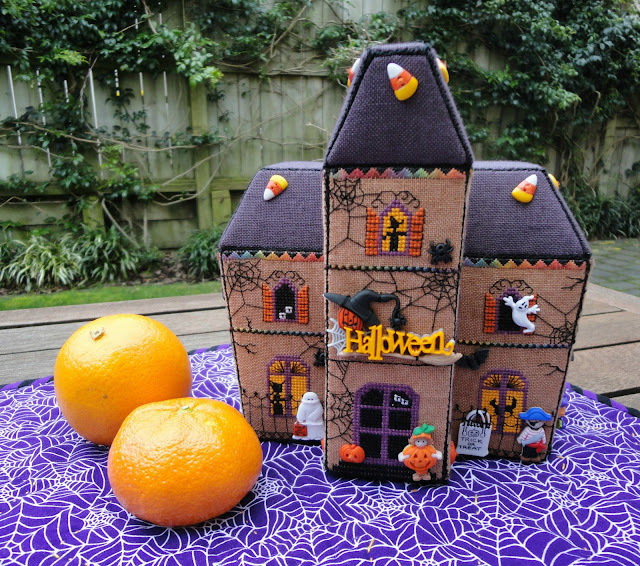 I came across your blog because I purchased one of the Victoria Sampler gingerbread houses (3D sewing--woohoo! ), but when I realized they were all different sizes (ie: doors would fit different sized imaginary people), my obsessive tendencies kicked in and I realized I'd have to purchase all of them before I started any of them in order to figure out how to make them all the same size, which really seems like more work than its worth when I have a million other ideas that are my own! By the way, you mentioned using a curved needle for the corners. What is that? Where does one buy that? Why did it help you in making them? Thanks for any answers you have time to give. I'll keep reading along!